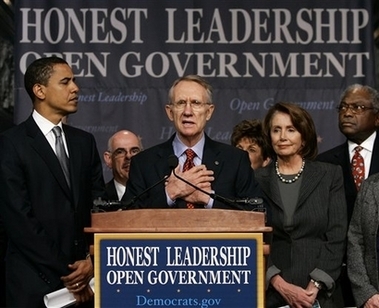 Can't you just read Pelosi's mind in the above picture as Harry gives a heart felt speech about honesty and BHO does his best holier than thou impersonation? She can barely keep a straight face. Laughing all the way to the bank apparently. This past Sunday night, Steve Croft of “60 Minutes” exposed how U.S. Congressional critters cheat, lie and benefit from insider trading on defense contracts. He cornered former Speaker of the House Nancy Pelosi with her investments gained from her inside knowledge of multi-billion dollar contracts. Pelosi boasts multi-millionaire status along with over 200 other members of Congress. She responded that everything she had done as to investments was legal. In reality, she cheated before a law could be passed to stop the cheating. For example, Tour de France bicyclists injected drugs for years to win the coveted title while the ones that played by the rules never had a chance at the victory podium. Once the cheating was deemed illegal, the cheaters had to play by the rules and not inject performance enhancing drugs. In the same line, Croft interviewed a former U.S. senator who had introduced a “Stock bill” law to stop Pelosi and dozens if not hundreds of other congressional representatives from benefiting from insider trading knowledge as to defense contracts. That senator garnered a scant six other reps to sign on to the bill. It has languished in committee ever since. In a word: sickening. In other words, the people elected to enforce our laws become the people that break our laws or don’t make laws to stop the cheating—in order to benefit themselves. It reminds me of President Richard Nixon saying, “I’m not a crook.” But in reality, while Watergate proceeded, Nixon cut a deal with the American Milk Producers Association to pay him $2 million dollars in order to sign a deal to jack milk prices up by $100 million. (Source: Fresh Air, National Public Radio, November 16, 2011) Nancy Pelosi and countless other members of Congress play the same game today. You wonder why we suffer 15 million unemployed while that same Congress insources, outsources and offshores American jobs. You wonder why 45.2 million Americans subsist on food stamps. You may become distressed that 8 to 10 million illegal aliens work jobs in America with impunity. You may wonder how come our middle class continues vanishing right before our eyes. Answer: our U.S. Congress. Thomas Jefferson hated Great Britain because of the landed gentry, the power elites—either by birth or class status, not talent—maintained a stranglehold on the financial wealth of the empire. The royalty enjoyed wealth by birthright, not by ability, education or personal effort. Even today, Prince Charles has not worked a day in his life. His mother Queen Elizabeth has not completed a single day of work to further her country’s well being. Prince William today walks around with his bride Kate on a free taxpayer ride through life. He is the lucky recipient of the sperm lottery and nothing more. The common man did not in Jefferson’s time and does not in our time stand a chance against the power elite. Today, the power elite in Washington DC empower themselves to enrich themselves at the expense of our republic. While Nancy Pelosi and her colleagues enrich themselves with insider information on defense contract business deals, we suffer 15 million unemployed Americans, 45.2 million Americans subsisting on food stamps, $12 billion in costs per month for endless wars, trade deficits and a $14 trillion national debt. Has Barack Obama accomplished anything to solve those problems? Answer: nothing in three years. How can the common man fight back? Jefferson and the founding brothers gave us a method for dealing with gross incompetence and gross greed.